What does a typical day look like for a criminal justice graduate? It’s natural when considering any degree to ask yourself what a typical day working as a professional in your chosen field will look like. After graduating with a degree in criminal justice, you may choose to pursue a wide variety of careers including police officer, detective, police chief, parole officer or criminal profiler. Details of what your typical day entails will depend on the specific occupation you choose, but in all criminal justice careers, you’ll be using knowledge learned during your studies including statistics, criminal psychology, research experience and writing skills. 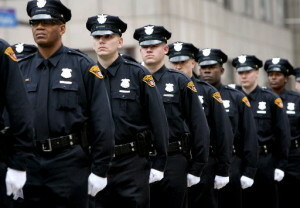 You’ll need at least a bachelor’s degree in Criminal Justice to become a police officer. According to the websiteCareer Profiles, typical duties of a police officer include patrolling, attending briefings, responding to emergencies, writing reports and serving the public. While most police officers will tell you that the job involves a lot of routine work, responding to emergency calls makes it exciting and worthwhile. A beat officer typically receives a promotion to a detective role after years of distinguished service. As a detective, your typical day would include interviewing suspects, consulting with experts, writing reports and presenting evidence in court. You would use a variety of skills including your knowledge of research, working with people and resolving conflicts. At a minimum, a police chief should have a bachelor’s degree in criminal justice, but many also have a master’s degree in a related field, such as business. According to the website, Straighterline. detectives typically spend their days conducting briefings, mentoring officers, enforcing departmental rules and completing paperwork. To be successful, you must balance your people skills with your talent for objectivity and attention to detail. After graduating with your bachelor’s degree, you can also choose to pursue an occupation as a parole or probation officer. Typical duties, according to Career Profiles, include conducting check-in meetings with parolees/probationers, visiting clients in their homes and at their jobs, working to educate the general public, writing reports and deescalating volatile situations. Your work in corrections may be in the community or in prisons or jails. College professors must have a Master’s or Doctorate in Criminal Justice, according to the National Education Association. A typical day for a college professor involves developing curricula, teaching courses, conducting research, mentoring students and attending faculty meetings. Graduates of criminal justice programs obtain a variety of skills that can be applied in various jobs in the criminal justice field depending on your aptitude and interests. No matter the job, criminal justice graduates can expect to apply skills they learned during their degree, such as how to investigate a crime scene, how to manage a crises and how to respond to the public with a sense of authority.